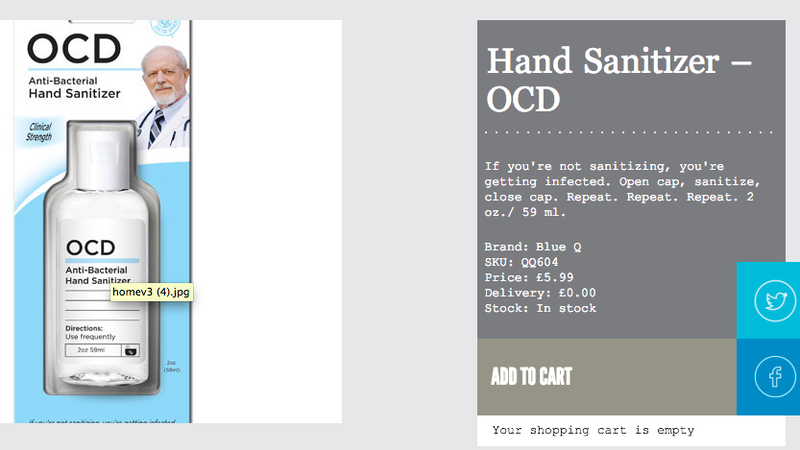 You probably haven’t thought it through – and I’m sure you don’t mean to cause offence – but I wanted to highlight some of the problems with your OCD Hand Sanitizer product and the accompanying text. OCD is an incredibly debilitating mental health problem. So much so that the World Health Organisation ranks it in the top 10 disabling illnesses (both mental and physical) in terms of lost earnings and diminished quality of life. Yet it remains one of the most misunderstood and trivialised of conditions. “I’m so OCD” or “I’m a bit OCD about that” has become shorthand for “I like things to be clean” or “I like things in the right order”. Comedians joke about it. We’ve all seen a picture on social media of some slightly misaligned objects with the caption ‘This is sending my OCD crazy’. Products like this perpetuate those myths. OCD gives people constant negative, repetitive and intrusive thoughts, combined with an ongoing feeling of doubt or danger. These are the obsessions. Compulsions develop to try and quell the thought or quieten the anxiety. They can be things like repeatedly checking a door is locked, repeating a phrase over and over again in your head, checking how your body feels, cleaning or repeatedly asking for reassurance. The relief caused by completing a compulsion is usually short lived and before long the anxiety and mental discomfort caused by the obsessions and doubts rises again. You can get stuck in an exhausting cycle of rituals and often choose to avoid places or people that may trigger their obsessions. Your day to day life is disrupted and relationships may be strained to breaking point. Intrusive thoughts can be graphic, violent or scary. You may be very ashamed of these thoughts and spend a long time checking whether they might still be there and how you feel about them (for example ‘am I still appropriately upset by them?’). You may feel the thoughts mean there is something ‘wrong’ with you as a person – and don’t feel able talk about them or ask for help for a long time. Every time someone says “I’m a little bit OCD” , shares an OCD joke on social media or sells a product that makes light of it, they add to the impression that OCD is trivial – even a bit comical. This makes it much harder for people to seek help or even open up to their friends and family – and for research and support services to get their share of limited funding. Imagine if you had to explain to friends and family what cancer really was, how it affected you and that it wasn’t an amusing or comical condition. Imagine how isolating it would be if they still didn’t really understand or made conscious or unconscious judgements about what it ‘really’ was based on jokes and viral pictures on social media. Imagine if shops sold joke ‘cancer hats’ which you could put over your own hair to look as if you were having chemotherapy. It already takes an average of over 10 years for people with OCD to seek help. Often that’s because they don’t realise that they have a recognisable condition with potential treatment options. If you’ve always been led to believe that OCD is just a quirky approach to being clean and organised then you might not realise that the intrusive thoughts or crippling doubts you’re constantly fighting are also OCD. Language is a powerful thing – even small everyday comments, ‘funny’ product descriptions and cheeky ‘likes’. Let’s use it to learn more, to support others and to fight stigma and misunderstanding rather than perpetuate it. 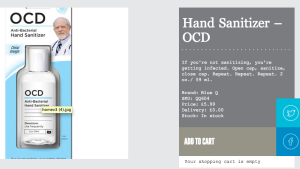 Please consider reading a little more about OCD and removing this product from your shelves. This entry was posted in All posts, Writing my mind and tagged Anti Stigma, OCD, Stigma on September 18, 2016 by fostress. 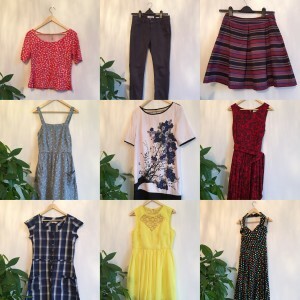 I’m selling some of my favourite clothes. Some of them are definitely too small. I bought them when I was at my lowest weight last year. Fitting into a smaller size was an unhealthy but irresistible boost to a fragile self esteem that had narrowed to focus only on my weight and ability to exercise to exhaustion. They hang in my wardrobe now and remind me, daring me to go back there. It would only take some long runs and a few weeks of restriction. They are better off living with someone who is naturally a smaller size. Some of them still just about fit. They’ve always been close fitting, that’s just their style. As a result they are often barely worn – rejected because my muddled mind translates their constant pressure on my skin as a sign of being too big. But now I’m working to reduce my exercise without restricting my food. My body is softer and larger. Getting dressed is one of the most difficult times. Tight and restrictive clothes risk triggering an avalanche of recrimination, irritation and anger. Yesterday I threw a banana at the wall. It’s funny now but at the time I was so angry at my mind for telling me I had to choose fruit over toast until I had run (on a day when I wasn’t supposed to be running at all). My favourite clothes are a tangible reminder of change that doesn’t always feel welcome. I’m trying to learn to like a softer, curvier frame but it’s hard. I’m scared of losing control. I’m fighting to stay away from unhealthy patterns of thought that started carving deep grooves in my mind when I went on my first diet aged 9. It will always be much more comfortable to let go and slide back into them than to resist and live day in and out in a body that feels heavy and uncomfortable. It’s easier if I don’t risk it, if I say goodbye to those clothes and that time and look forward. I can’t afford to buy a whole new wardrobe but I’ve bought a few larger sizes, baggier clothes. They help me forget the discomfort and move my focus to all the other brilliant things in my life – work, family and friends I love. In the past the fact I KNEW they were a bigger size would ruin this comfort. That disordered inner voice would keep reminding me that wearing a larger size meant I’d failed. That I wasn’t in control. Ridiculously I would rather be uncomfortable and sad in clothes too tight than admit I am bigger and be happier in clothes that fit. But this time I’m determined to make real change – for my mind, for my body and for the hope of conceiving. “One of the most painful things about this period is The Shorts. I have a pair of denim shorts whose label bears the glorious declaration ‘Age 6-7’ and they become one of The Voice’s favourite instruments of torture…. eventually it is a panting struggle to pull them on and when I take them off I have crusty sores on my skin where the denim has rubbed me raw. I don’t know whether it is because I need reassurance that my body is still acceptably small or because the pain of wearing them serves a hair shirt, self flagellation purpose, but from the time I hit my lowest weight to three, four, five months afterwards, The Voice insists I wear these shorts every day”. Her anorexia was far far worse than any disordered eating I have experienced. But her words show the incredible power that the warped voice of eating disorders can give to clothes and clothes sizes. After 23 years of letting buttons, zips and waistbands rule my life, it’s time to start letting that go. This entry was posted in All posts, Writing my mind and tagged eating, Eating disorder, eating problems, Exercise addiction, Mental Health, Recovery, Running on September 10, 2016 by fostress.